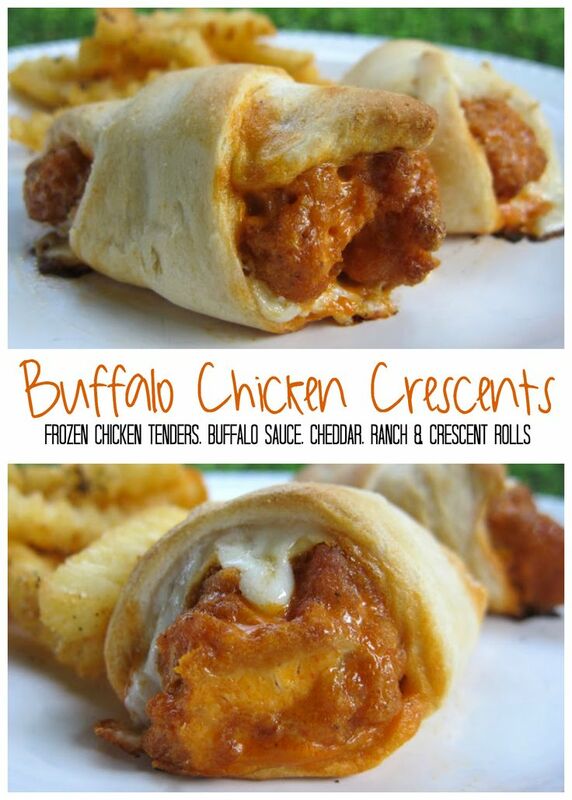 Buffalo Chicken Crescents Recipe - quick recipe for a weeknight meal or quick lunch. Also great at parties! Frozen chicken tenders, buffalo sauce, cheddar cheese, Ranch dressing baked in refrigerated crescent rolls. Serve with fries for a quick dinner! SO good!! A few weeks ago we made Parmesan Chicken Crescents. They were a huge hit in our house. I immediately started thinking about what else I could make with chicken fingers and crescents, and I came up with these Buffalo Chicken Crescents. They were fantastic!! We served them with fries, because you can't eat wings without fries. Well, at least that is the rule in our house. I instantly thought this would be perfect for Father's Day - since most men I know love wings and fries. This recipe is quick and easy enough for the kids to help prepare. Make this for lunch or dinner on Sunday; I guarantee everyone will love it! Pour wing sauce and 1/4 cup ranch dressing into a bowl. Place one half slice of provolone cheese on top of crescent roll. Dunk chicken finger into wing sauce and place on top of cheese. Roll up crescent and place on cookie sheet. Repeat with remaining chicken fingers and crescents. This is one of those you look at and think - now why didn't I think of that??? They look delicious, and so easy! Some foods just have to have fries. A good meal to me! YUM! I can't wait to try these and the parmesan ones! I'm going to make these tonight but with cheddar cheese instead of provolone. Hopefully they turn out just as good. I've been making a quick variant on this for years. It's so yummy! I use more of the dough and make more of a pocket than the rolling over but that's since I use canned chicken, not fingers. I use premium canned chicken, Frank's red hot, crescents and used to use ranch and cream cheese but now I use 1/2 cream cheese and 1/2 laughing cow blue cheese. I'll have to try this with the chicken fingers tho! I made these one night for my nephews, they're huge buffalo chicken boys, and they absolutely loved them! They're good to grab and go for these busy boys! I also made bbq chicken ones for the ones that don't like everything spiced up! It was a definite hit at this house! These are awesome and so easy to make! Weird question... do you use the frozen Tyson Crispy Strips? If so, do you cook them before you wrap them up? Thanks... I want to make these tonight! Carissa - I used the frozen Tyson chicken strips. Do not bake them before you wrap them up. They will bake with the crescent rolls. Enjoy! really good. we even made some with just ranch and not the wing sauce, to avoid being spicy. those were good too. i like the idea of a little bleu cheese with it, that would be awesome. oh, also i didn't use chicken strips. i put 2 frozen chicken breasts in the crock pot at lunch time and they were tender and ready to use just in time for dinner. I will be trying these. Id like more ideas if there are any? ?